In our continuing devotion to enriching tango in Cambridge and bringing the Argentine tango culture to the East of England and especially the Cambridge tango scene, Tangueando arranged a visit in Cambridge of this elegant and dynamic couple of professional Argentine dancers, who were crowned Tango Salon World Champions in Buenos Aires in 2012. In their third visit in Cambridge, Facundo & Paola gave a number of tango and vals workshops and a Tango salón seminar and also performed at milonga Pasional. Have a look at their background and some of the videos we selected for you. Summer is here: keep calm and embrace! Facundo and Paola helped us improve our embrace and better connect with our partner through their teaching that goes beyond the study and understanding of body dynamics and the technical aspects of tango dance: they also convey the notion of Tango as a social, cultural and popular expression, of which they are celebrated representatives. Facundo & Paola are talented representatives of a generation of young dancers who are dedicated to the art and tradition of tango salon. Hailing from the provinces of Cordoba and Chubut, they have honed their dance for more than 12 years, 8 of which have been together. Their constant exploration of the essence of tango salon, elegance, connection and musicality has allowed them to evolve their dance in a unique yet traditional way. After gaining various titles in recognition of their talent in a few competitions in Argentina, they moved to Buenos Aires last year to take part in the thriving environment of the tango capital. They have been met with welcome, giving classes (El Beso, and La Nacional) and exhibitions in various milongas (La Viruta, Gricel, Villa Malcolm, Porteno y Bailarin, La Nacional, La Milonga del Patio, and El Viejo Correo, Sunderland). 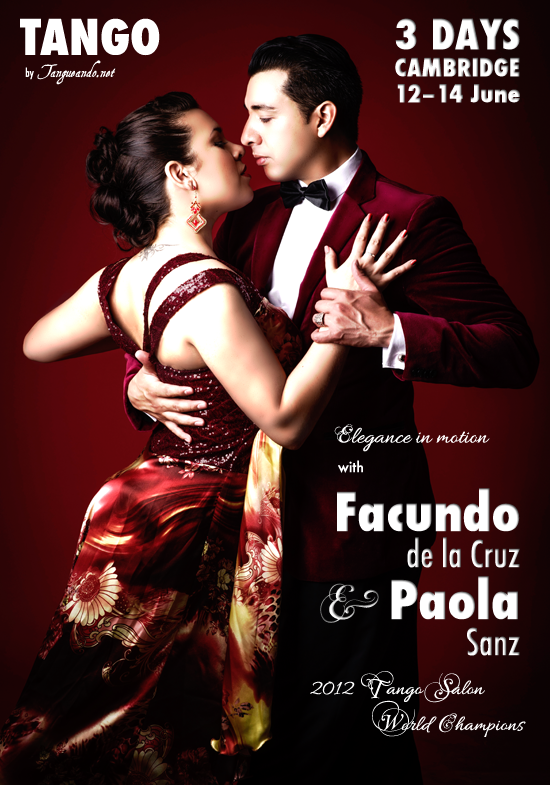 In July 2011, Facundo & Paola were selected as winners in Tango Salon and Milonga by a unanimous vote by the judges Osvaldo and Coca, Roberto Herrera and Lorena Goldestein, Jorge Garcia and Susanna Soar, and Gabriel Glagovsky and Rui Saito in the Festival Nacional de Tango Salon. In May 2012 they were awarded 1st prize in the Vals category in the annual Metropolitano championship, in which all of young and upcoming Buenos Aires talent compete in various milongas in Buenos Aires. They also placed 3rd and 4th in Milonga and Tango, ending up as the only couple to place in all three categories. Later the same year, in August 2012, Facundo and Paola were awarded the title of World Champions of Tango Salon at the 10th World Tango Championship, judged by Maria Nieves, Olga Besio, Aurora Lubiz, Julio Balmaceda, Julio Duplaa & Javier Rodriguez. As a consequence of the recognition they achieved, Facundo & Paola decided to bring their talent abroad. Join them as Facundo prepares to share his crisp enrosques and sharp syncopations, and Paola her delicate and elegant footwork. Visit the Facebook event to confirm your attendance and to share with your friends. It is worth mentioning, regarding all the different topics, that in addition to the study and understanding of the behaviour and movement of the body, Facundo and Paola's aim is set at conveying the notion of Tango as a social, cultural and popular expression, beyond the dance itself. Circulation and control in reduced spaces, how the follower adapts to the dance of the leader, intention, axis and balance. Music, musical interpretation, phrasing and pause. Exploring musicality in vals using different dynamics and giros. The workshops and the Seminar were for a very limited number of couples where everyone received lots of individual attention from Facundo and Paola. Tango: «El Tigre millan» by Juan D'Arienzo y su Orquesta Típica.